Prešov eparchy. A Byzantine rite Catholic eparchy in western Transcarpathia, with its see in Prešov, now located in eastern Slovakia. 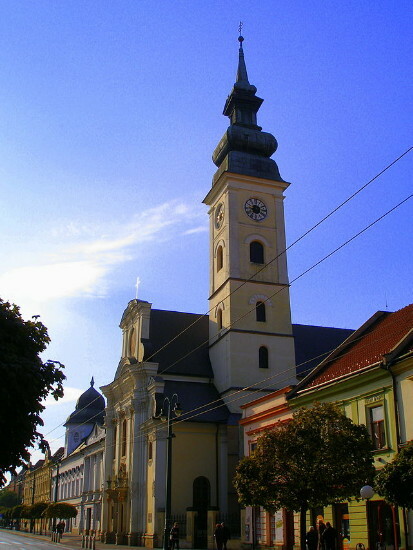 Prešov eparchy was proposed in 1816 by the Austrian emperor Francis Joseph I and was formally erected by Pope Pius VII in 1818. Encompassing 194 parishes with approximately 150,000 faithful, it consisted of the Košice Greek Catholic vicariate (est 1787) of Mukachevo eparchy. The eparchy’s bishops have included Hryhorii Tarkovych (1821–41), Yosyf Gaganets (1843–75), Nykolai Tovt (1876–82), I. Valii (1883–1911), S. Novak (1913–20), Dionisii Niaradi (1922–7, as apostolic administrator), Pavlo Petro Goidych (1927–50), and suffragan Vasyl Hopko (auxiliary bishop in 1947–50). Among the institutions established in Prešov were an eparchial seminary (est 1880), a seminary for precentors and teachers (1895), and a Greek Catholic gymnasium (1936). Most religious orders active in the eparchy—the Redemptorist Fathers, the Basilian monastic order, and the Sisters Servants of Mary Immaculate—were established under Bishop Goidych; the Basilian order of nuns was active there from 1922. Several major swings in national orientation have marked the history of Prešov eparchy. By the turn of the 20th century many of the clergy, in particular the church hierarchy, displayed a marked Magyarophilism and favored the Latinization of the church. In reaction the Russophiles of the region launched a concerted effort to establish a (Russian) Orthodox church in Transcarpathia, which they hoped would lead most of the Prešov region parishes away from Greek Catholicism. Under Bishops Dionisii Niaradi and Pavlo Petro Goidych, however, the church stressed its Ukrainian and Eastern character and successfully countered most of the Russophile efforts. During the Second World War, Prešov eparchy gained jurisdiction over several new areas, and by 1948 it included Prešov eparchy proper (143,000), the Mukachevo eparchy’s administration (80,600), and the Czech and Moravian administrations (68,400), for a total of 292,600 faithful. On 28 April 1950 the eparchy was forcibly converted by Communist authorities to Orthodoxy at the so-called Prešov Sobor. This action was accompanied by the formal liquidation of the Greek Catholic church, the closing of monasteries, the arrest of both bishops, and the arrest and imprisonment in labor camps of most of the clergy. Authority over the eparchy was claimed by the patriarch of Moscow, who established four administrative jurisdictions in Czechoslovakia: the archeparchy of Prague and the eparchies of Brno-Olomouc, Michalovce (including parts of the Mukachevo eparchy administration), and Prešov (virtually intact territorially). On 23 November 1951 these were united into the Autocephalous Orthodox Church of Czechoslovakia, and E. Vorontsov, a Russian, was placed at the head of the church by the Moscow patriarch. From 1964 the church was led by the Transcarpathian-born Dorotei Fylyp. In 1968, during the Prague Spring, the government allowed the restoration of the Greek Catholic church in Czechoslovakia. In Prešov eparchy 204 of 246 churches and 69 priests returned to Eastern rite Catholicism. Bishop Vasyl Hopko, who had assumed leadership of the Prešov eparchy after Pavlo Petro Goidych's death in 1960, returned to Prešov to assume his post, but was not permitted to do so. A struggle for control over the eparchy erupted between Slovak and Ukrainian Greek Catholics. One of the Slovaks, I. Hirka, emerged as administrator of the eparchy in 1969 and launched a campaign for the Slovakization of the eparchy, in which effort he was supported by the Slovak authorities. In response many Ukrainian Catholic and even some Slovak villages returned to the Orthodox church, where the Church Slavonic language was used, and the Eastern rite adhered to. Hirka was ordained bishop in 1990. Today the bishop of Prešov eparchy does not retain any formal ties to the Ukrainian Catholic church and does not participate in the church’s synods.